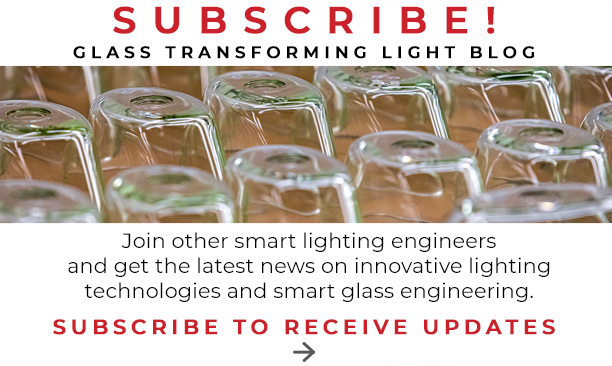 New blog bridges the gap between glass science and new lighting technologies in the interest of sharing knowledge to create a safer and more productive world. The introduction of new light-based technologies brings both exciting benefits and complex challenges to lighting engineers. Traditional designs and materials do not fully leverage the energy savings of these new light sources. Lighting engineers eager to harness these new technologies often struggle to incorporate them into their design because they don’t have the specialized technical or manufacturing experience to address these challenges. Fundamental research at industrial laboratories, such as Bell Labs, has declined since the mid-1980s. Manufacturers are operating on tighter budgets in an effort to realize higher margins. Corporate research facilities have been shuttered and scientists have relocated to smaller research firms. As a result, manufacturers are no longer able to solve many of these problems internally. And often times, they’re forced to come up with solutions that they’re not best equipped to solve. Many of these questions are echoes of questions we’ve heard in the past and continue to hear on a daily basis. When precision glass is needed for demanding applications like explosion proof lighting or exterior aircraft lighting, engineers without glass expertise are challenged to answer these questions. Unfortunately, in some industries, collaboration through the supply chain is often limited and engineers are prohibited from engaging with their suppliers. They aren’t able to ask these questions and as a result the product development cycle is subject to time-consuming redesigns and increased costs. These questions and challenges will only increase as new technologies emerge and continue to disrupt the lighting market. Our customers come to us because there is a lack of glass manufacturing knowledge that is easily accessible. We operate in a highly specialized niche of the glass industry and have worked very hard to develop a team of creative, highly-motivated, and skilled people. They are the foundation of Kopp Glass and without their expertise and knowledge – we wouldn’t be able to produce high-quality precision glass products. We realize that this knowledge is unique and we’re excited to share it with a broader audience through our new blog, Glass Transforming Light. At the heart of this blog is a team of passionate and innovative glass scientists and engineers who seek to collaborate to create the best lighting products in the world. Our mission is to make the world safer and more productive through excellence in glass science, collaborative innovation, and the production of glass for unique and demanding applications. Comment on industry developments and news. In the face of continual advancements in lighting technology, materials, and fundamental research, you must anticipate instead of react to the changes and needs of your markets. We’ll share information that will help you be both nimble and proactive to these challenges. I encourage you to explore our blog and to subscribe to receive updates. We’re entering a new lighting era that is full of exciting opportunities and we’re eager to explore the world of glass and light with you. Grant Wirth Grant joined Kopp Glass in 2008 as President and CEO. Since then, he has relentlessly driven the company toward leveraging and reinvigorating its core competencies and being the best in the world at manufacturing hand molded, specially formulated technical glasses for unique industrial applications. To him, being the best boils down to doing a handful of very important things flawlessly and living our core values every day.